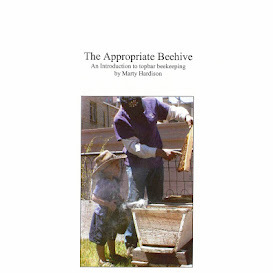 A MOISTURIZING HAND & BODY LOTION for use before and after a visit with the bees. "Calendula flowers rubbed into beestings are said to relieve the pain." Made with light, moisturizing oils and cooling distilled water – feels great even if you haven't been stung. Pure beeswax and vitamin E for skin repair. Barely scented with essential oils of lemon, lemongrass, rosemary and clove bud. Clove oil is reported to both prevent stings and numb the pain of a bee sting. Some associate the scent with a trip to the dentist, where clove oil has historically been used to numb pain, so upon request, I make this cream with other aromas or unscented. Let melt. Stick blend until smooth. When cool, blend in 8 drops of essential oil(s) of choice. I like to whip in an antimocrobial, too, but that's up to you. Containerize but don't cap until fully cooled. Makes approx. (5) 3 ounce containers plus plenty for a tester. 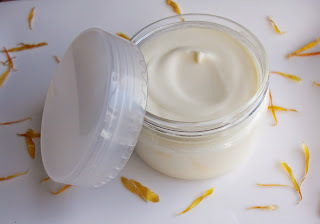 * I always infuse my oils with calendula, the orange petals of which are hand-selected.